On Saturday, I spent the day with the sun on my back, picking grapes amongst the vines on a south facing hillside in…. Yorkshire! I really could have been anywhere in Europe harvesting the Ortega & Solaris grapes, well other than I had wellies on as it had been very wet the day before and the dew and damp hung heavy on the grass and the grapes! The day started with a 2 hour drive over to East Yorkshire, we were met with a brew and a chat about the days harvest and introduced to an eclectic mix of fellow volunteers, we swiftly moved on to the first pick a mile down the road at another vineyard aptly named “Paradise” and after a brief lesson with the secateurs we were left to fill the boxes with fantastic sweet, plump Solaris grapes. 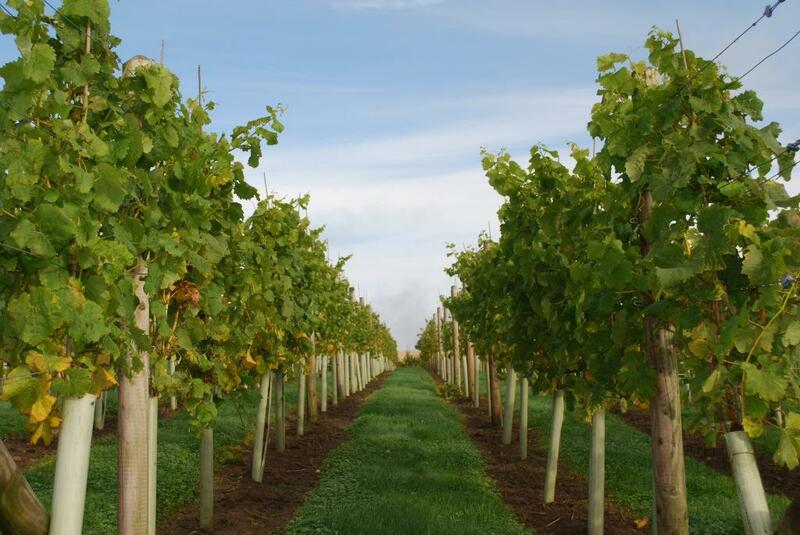 To grow grapes this far North, (Ryedale Vineyard is the most northerly vineyard in England) does not require any special vines or land other than a disease resistant variety and a south facing slope with good drainage, which is the same the World over. After a only an hour & a half, it was brew time with homemade cakes, a quick count of how we were doing so as to calculate when lunch would be served back at the lovely farmhouse. We finished the patch of Solaris at Paradise Farm and headed back for a hearty lunch of stew, mash, roast potatoes, cabbage and peas then apple crumble & custard. 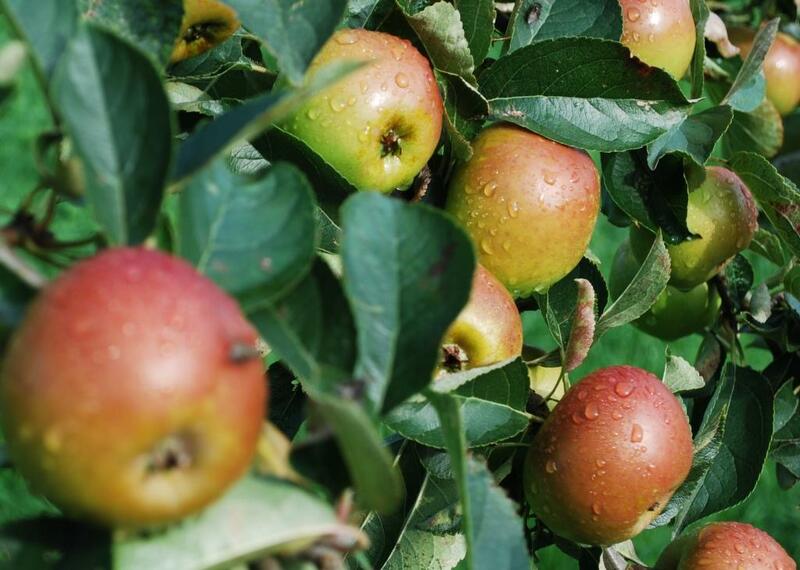 Apples for the pud from the abundant trees around the vines. Of course the meal was washed down with a glass of dry rose English Wine (should that be Yorkshire Wine?). Ryedale Vineyard offer the opportunity to volunteer for the grape harvest throughout October with the promise of plenty of Tea & Cakes and a good lunch with wine and the wonderful experience of the harvest. A once in a lifetime experience, get in touch and go along and help, they do B&B so you can make a weekend of it. 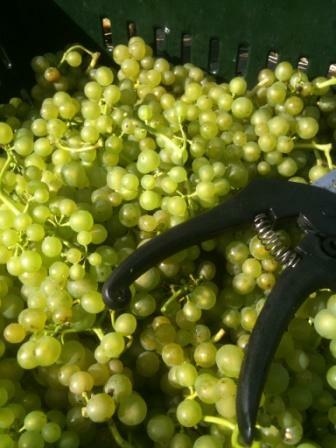 Thanks to Slow Food North Yorkshire for the heads up about volunteering for grape picking. 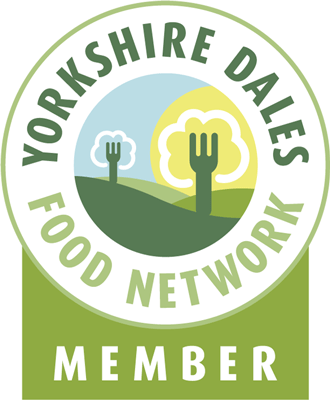 This entry was posted in wine, Yorkshire and tagged english, grapes, harvest, Ortega, solaris, vines, vineyard, wine, Yorkshire. Bookmark the permalink. I’m a researcher for ITV and we’re looking for people to take part in the new series of Britain’s Best Dish to represent the Northern region by putting forward a dish which they love to cook. This can either be a starter, a main course, or a dessert. I was wondering if I sent you a poster, if you would be able to upload this to your blog in order to help spread the word. We’re trying to generate as much interest as possible so it would be great if you could help us to let people from your region know about this opportunity. Please get in touch on danielle.davies@itv.com or 0207 1574719 – If somebody gets in touch with me with an email address, I will be able to send a poster over.